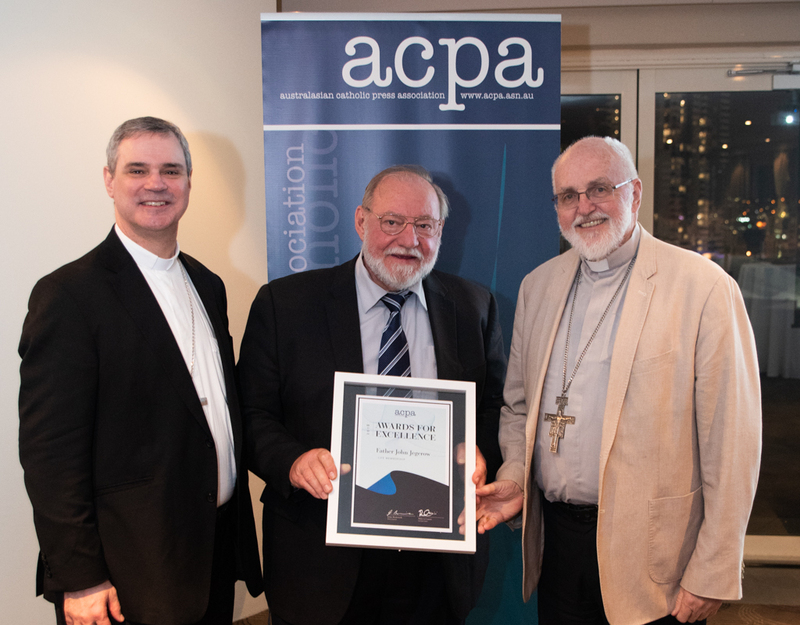 ACPA was pleased to induct two new Life Members at the 2018 ACPA Awards on 5 September – Fr John Jegorow and Ms Jane Favotto. Our ACPA archivist and fellow life member, Fr Frank Freeman, wrote the following citations, which were read out at the induction. Jane has been an extremely active and dedicated member of the Australasian Catholic Press Association for many years. Her 25 years’ of industry experience covers a wide range of publishing and communications roles, including publication officer for the Pharmacy Guild, stints at NSW regional papers and 14 years at Melbourne’s The Age. However, it was when she was appointed editor of the Broken Bay News that she ‘found the Catholic church the most fascinating place she had so far worked in’. In 2001 at the Christchurch conference, Jane was elected secretary of the association and held that responsibility for three years. Subsequently, at the Adelaide conference in 2006, Jane was elected President and remained in that office until 2009. Her presidency was marked by her friendliness, approachability, an ability to work with her executive and members of the Association and her sensitive care for them as persons in their moments of difficulties. These were years of consolidation and growth of the association’s membership in Australia and New Zealand. Significantly, this period is also notable as it includes the first inclusion of the Oceania, Papua New Guinea and the Solomon Islands. Jane encouraged the rebuilding of the ACPA website and an expansion of its archives through research into the history of the Association. Additionally, Jane’s executive reassessed the ACPA Awards and made changes to reflect the breath and talent in the membership. In September 2002, Bishop Manning appointed her to the post of diocesan communications manager and as the editor of Catholic Outlook. Over the next decade, circulation increased to 40,500 copies distributed each month through 47 parishes and 86 Catholic schools. In 2009, Catholic Outlook received the Bishop Philip Kennedy Memorial Award for Excellence. This is the highest accolade awarded by the Australasian Catholic Press Association for magazine publishing. In 2014 Jane was awarded Diocesan Medal of Honour with the citation reading “Extraordinary gifts and generosity: For her tireless commitment to Diocese of Parramatta as Communications Manager, managing the communication needs of the Bishop and Diocese, and using her journalistic talent as Editor of the award winning Catholic Outlook”. It is indeed a privilege for the executive to award Jane life membership of the Australasian Catholic Press Association. Fr John Jegorow has always had a very keen interest in social communications. Indeed, from the very early days of his priesthood he has viewed good communications to be at the very heart of his priestly ministry. He gave great support and honed his skills in helping the late Fr Patrick Cunningham. editor of the Perth Record for many years and former President of the ACPA. John first attended an ACPA conference with Fr Pat Cunningham in Wellington New Zealand in the mid-1990s and since then has continued his attendance. His regular and cheerful attendance at the annual conferences of the ACPA, has not only been to keep abreast of development in the world of Catholic social communications, but also to render a pastoral presence of recognition of, and encouragement for all ACPA members. As such his presence has been much appreciated. John, as an editor, is very sensitive to the needs and interests of his readership and his writings are attuned to such. This skill has been evident in his 10 years as editor of The Swag, the quarterly magazine of the National Council of Priests of Australia and since 1992, The Cross Roads. The Cross Roads is a quarterly publication unique in the Australian church: some 15,000 copies are distributed free to all residents in five local suburbs. With this initiative he has certainly ventured “out into the deep” and as such its ground-breaking role was recognised by recent ACPA Awards. The publication features all the aspects of daily life across diverse beliefs and social, cultural and commercial interests. It has an all-inclusive readership and stand in evidence of John’s firm belief that our communications need to be aimed at and reach all people and not just the churchgoers. Nor is this belief confined to the printed word: he employs use of the new electronic media, his skills in photography, the world of architecture and the arts to communicate. The Parish Church of St Mary MacKillop which he built is a permanent catechetical lesson: it communicates so obviously the liturgical, sacramental and doctrinal tenets of the Catholic faith. Much of John’s priestly pastoral approach, with its all-inclusive means of communications, can be traced to his dual cultures. So obviously proud of his Ukrainian heritage he has skilfully wedded elements of its rich culture to the everyday practicalities of the Australian Church. As such Fr John Jegorow over many years has proved to be a valuable member of the Australasian Catholic Press Association. Pictured: Fr John Jegorow (middle) receives his life membership from Archbishop Peter A Comensoli and Bishop Joseph Oudeman. Jane Favotto was unable to attend the conference.